I went to Kabuto about ten years ago when it was on the North side of Geary and I remember it being very traditional, in fact, I don't even think they had spicy tuna rolls. It was a place to get nigiri, but I could be wrong. Apparently, that chef is gone and their current forte is sushi. This time we went for A's b-day and I'll definitely return. 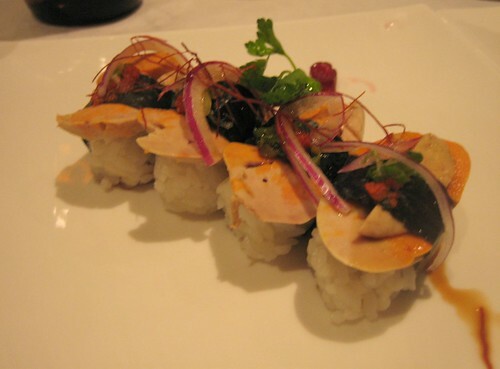 Loved the strong liver taste of the monkfish liver sushi. The 1849 Oysters has everything but the kitchen sink, an Miyagi with uni, ikura, masago, quail egg yolk and gold leaf. Get again: Monkfish liver, Foie Gras, 1849 Oysters. We had uni as nigiri and as a special sushi, in both versions the uni was very mild, so I'd pass on their uni. Next time try the cooked dishes, I spied the Japanese family next to me chowing down on some izakaya type offerings.